Pea Soup Andersen's provides the perfect location for any function, from business meetings to wedding celebrations. We would love the opportunity to serve as your host for your upcoming event. We are conveniently located to these nearby attractions: The San Joaquin National Cemetery/Korean War Memorial and the San Luis Reservoir. We offer private banquet rooms for your use and can accommodate groups of many shapes and sizes. The maximum occupancy for each room is listed below. We offer impeccable service, expert planning, and menus that are customizable, which we use to help you create your event. Our Terrace Room is a private room that can accommodate up to 60 guests. This room can be set up in a variety of ways including boardroom and U-Shape. The design of the Terrace Room is in keeping with the feel of the rest of the restaurant and does include skylights that provide natural lighting. Our Santa Nella Room is a private room that can accommodate up to 200 guests. The Santa Nella Room is a loft style room with its own private restrooms. Access to this room is by staircase. Pea Soup Andersen's can cater functions with a minimum of 100 persons at any location. Have a wedding, party, meeting, picnic, etc at your home, office, park or anywhere and Pea Soup Andersen's can provide the food and beverage services. 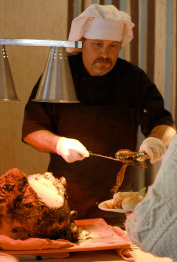 We would love the opportunity to use our impeccable service, expert planning and gourmet menus for your upcoming event. Let us help you create the event of your dreams! If you email us please include as much information as possible including: Desired Banquet Room, Your Name, Your Email, Your Phone Number, Desired Date of Event, Desired Time of Event, Number of Guests, Event Occasion and any additional comments.